If there is one group of fans who have mastered the waiting game, it’s fans of George R. R. Martin’s A Song of Fire and Ice series. I was six when Game of Thrones was released; I may be retired before the seventh one hits publication. The epic series asks the ultimate question: who will sit on the iron throne? Flickr user Omar Ovalle (Omar+Kazumi Ovalle) posted the words and emblems for some of the houses involved in the bloody struggle. These were posted over the summer, and hopefully will help the wait until Season 5 of HBO’s Game of Thrones in the spring. Click the links to see some of your favorite house below; just remember to avoid getting too attached. They may not survive the next book. One of the things I’ve loved about Citizen Brick from the first time I encountered their custom minifigs is their sense of humor. Joe and his crew at Citizen Brick make things you’ll never be able to buy in a LEGO set. Yes, you can buy usefully realistic military accessories, too, but they won me over back in 2011 with minifigs like “Botany Enthusiast.” Their latest batch of custom minifigs is titled “Dragon Sword Fighter Force,” which itself is hilarious, much like the over-the-top book series and premium cable TV show that clearly inspired these minifigs (obviously Game of Thrones). Dragons! Knights! Totally inappropriate family relations! 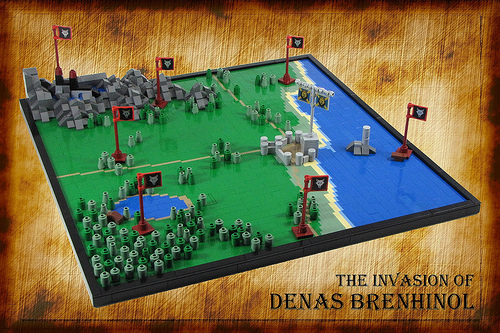 Join the adventure as these brave fighters cross swords with some of the most fearsome foes in the realm. Whether defending their kingdom or clamoring for the crown, these minifigs are ready for a battle royale to the death. Horde the complete series of stunning figs before every character you like is killed off. Your honor is at stake! Citizen Brick sent me a batch of the “Dragon Sword Fighter Force” minifigs recently, and I wasn’t disappointed. They arrived in three-minifig blister packs with the aforementioned description on the back, plus a 13th bonus minifig of some guy who looks like a fishing boat captain titled “Sir Typesalot” (which you get when you buy all 12 custom minifigs at once). As amused as I am by Citizen Brick’s subject matter, what keeps me coming back is the quality of their design work. Each custom minifig includes unique printing on nearly every available surface — face/head, torso (both front and back), arms, and legs. Many of the “Dragon Sword Fighter Force” minifigs also come with custom cloth accessories and weapons. The printing is indistinguishable from the printing on official LEGO minifigs, and the designs themselves don’t feel out of place from the world of LEGO (thus the big disclaimer, I suppose). At $55 for a three-minifig pack or $220 for the full set of 12 (which also includes the George R.R. Martin-esque author minifig), these aren’t inexpensive, and I suspect they’re not the sort of minifigs you’d just fold into your Castle/medieval collection for use in a crowded display at a convention. 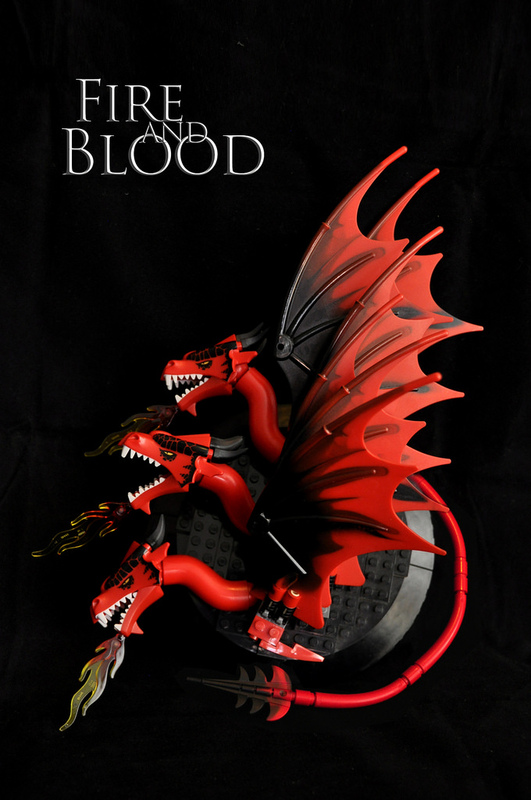 No, these are serious collectibles for the dedicated A Song of Ice and Fire fan. That said, they are certainly wonderful Castle/medieval minifigs, and I’m sure we’ll be seeing some of the cool parts from these figs on “hero” minifigs quite a lot (I just wouldn’t bury them in an army). Citizen Brick minifigs range from $15 to $25 (these are $16-18 depending on whether you get the three-packs separately or buy the whole set at once), so prices are well within the range of what other vendors are charging for custom minifigs. Now that so many vendors are producing custom-printed minifig elements at reasonably high quality, the distinguishing factors boil down to subject matter, design, and price rather than just availability and quality. Since price and quality are now somewhat less of a comparative factor, what continues to distinguish Citizen Brick minifigs is their often-humurous subject matter and consistently great design. 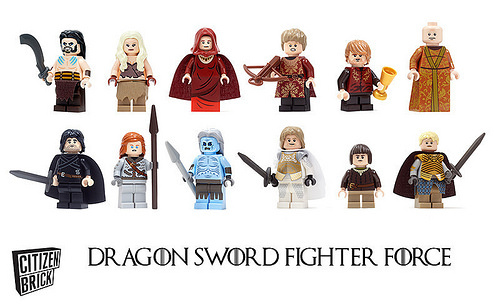 Although a bit on the pricey side as a complete set, I can definitely recommend Citizen Brick’s “Dragon Sword Fighter Force” minifigs to every Game of Thrones fan out there, because we certainly won’t be seeing an official LEGO Game of Thrones Collectible Minifigures series anytime soon. “Dragon Sword Fighter Force” minifigures are available on CitizenBrick.com. Ever wonder what the Master Model Builders at LEGOLAND Carlsbad like to do on their California State-mandated, twice daily, ten minute breaks? Well according to my source, (a mole positioned deep within the Carlsbad California model-shop known as “The Encroacher”) many of the Master Builders use the free time to build. Who can blame them? With one of the world’s greatest parts-palette to work with, the temptation to put it to imaginative use must be overwhelming. In my monthly meeting with “The Encroacher” he pointed me towards a posting from fellow shop worker Joel Baker. The model in question is a Miniland-scale interpretation of everyone’s favorite chair o’ doom, the Iron Throne from George R.R. Martin’s Game of Thrones. The model itself was actually constructed by a third Master Model Builder, Megan Correnti…yes this story is like a sweet onion, constant reader; layers upon layers. (edit) I just saw that the model was also featured on BrickNerd. Tommy Williamson does a great job on the blog, and it wasn’t my intent to poach his post. diegoboy brings one of the more infamous scenes of George R.R. Martin’s Game of Thrones series to life with his take on the “The Red Wedding”. The builder does a great job focusing the somewhat chaotic action of the diorama and he certainly doesn’t skimp on the gore. The current Iron Builder throw-down between Maddison and Lowell has been nothing short of spectacular and my favorite of the series to date. Although there have been many outstanding competitions in the past, I’m not sure I’ve ever seen two opponents that were so evenly matched in both style and productivity. While I’m not surprised that the Aztec God of Reseda has turned in a bevy of clever models (one only has to refer to his legendary battle with Legohaulic for proof of his Iron greatness), I am forced to wonder what the hell has gotten into Chris Maddison (cmaddison). Please excuse an American a baseball reference, but it’s kind of like a punch-and-judy journeyman middle-infielder suddenly became a power-hitting all-star overnight. As soon as I’m done with this posting I plan on contacting the folks at Iron Builder to suggest that Maddison be subjected to a drug screening and background check immediatately. In the meanwhile, please enjoy Maddison’s latest hammer-fist to the crotch of Lowell. The build reminds me of the opening to Game of Thrones opening sequence, and recalls any number of strategy board games. In short, you can’t stop C-Mad, you can only hope to contain him. Lowell must go down! The Iron Throne, that notoriously uncomfortable chair at the heart of the turmoil in Westeros in George R.R. 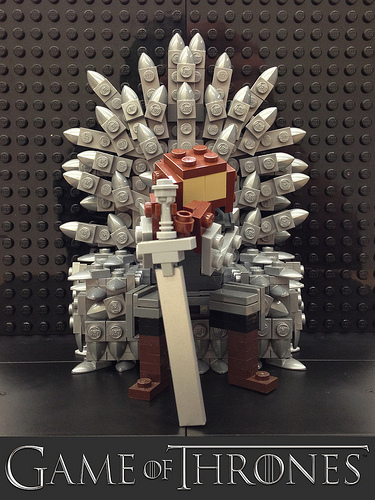 Martin’s A Song of Ice and Fire series, has been wonderfully recreated in Lego by Jacob Nion. And of course, to accompany it is the beloved, if ill-fated, Ned Stark, Hand of the King. 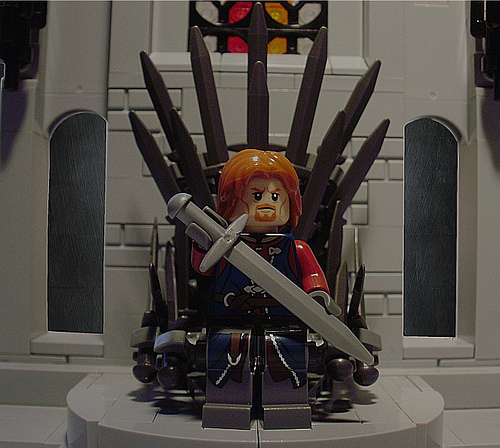 Jacob is following the styling of the HBO television series A Game of Thrones in his interpretation of the throne and of Stark, and nicely enough, Ned Stark is easy to recreate in Lego form thanks to actor Sean Bean already having been made in Lego in the character of Boromir.